The Monetary Authority of Singapore (MAS) signed a Memorandum of Understanding with its Hong Kong counterpart in November 2017 to jointly develop a cross-border distributed ledger technology (DLT) based infrastructure that will link up digital trade platforms and the growing number of trade-related DLT platforms and communities around the world. In this article, Singapore Customs presents this new initiative called the ‘Global Trade Connectivity Network,’ which is expected to be operational in 2019 as well as the new trade information management ecosystem called the ‘Networked Trade Platform,’ which was officially launched in September 2018, and explains how the two systems play complementary roles in stitching up the global trade ecosystem, empowered by both DLT and non-DLT based technologies. 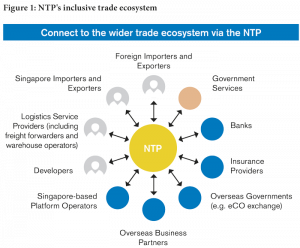 In December 2017, Singapore’s Networked Trade Platform (NTP) became operational. A new one-stop trade information management platform, the NTP will connect digital islands across the entire trade ecosystem from traders’ enterprise resource planning systems and other proprietary systems to freight forwarders and freight management systems, to last mile delivery and tracking services. The new Platform will incorporate services currently provided through two systems: TradeNet®, Singapore’s National Single Window (NSW) that caters for Business-to-Government (B2G) and Government-to-Government (G2G) connectivity, and TradeXchange®, a 10-year old information technology (IT) platform that enables the exchange of both Business-to-Business (B2B) and B2G information. Services from TradeXchange have since been migrated to the NTP. The new NTP introduced a suite of user friendly features and value-added services to help the trade and logistics communities. Since then, the user base of the NTP has more than doubled compared to TradeXchange. In June 2018, Singapore Customs began the progressive migration of B2G trade services, currently available through TradeNet, onto the NTP. TradeNet is almost 30 years old. Launched in 1989, when the Internet was still the domain of academics and researchers, it was well ahead of its time and its successful implementation captured the imagination of many – most aptly in the 1990 Harvard Business Review case study “TradeNet: A Tale of One City.” Today, the concept of a NSW is well understood. In 2007, another chapter was written when TradeXchange was launched as part of an effort to unify the B2B trade ecosystem. Fast forward to 2018 and the NTP. It will enable the exchange of digital trade data from source, across various B2B and B2G transactions along the entire lifecycle of trade: ranging from purchase orders and invoices, permits and shipping instructions to trade finance applications, payments and reconciliation. Today, a single trade can involve over 25 parties, generating 30-40 documents, and about 60-70% of the information is manually re-entered at least once. The potential value of stitching disparate digital islands together is immense. In addition to productivity, efficiency and accuracy gains, there is a multitude of opportunities for innovation as data becomes connected. These bold steps have not gone unnoticed – in 2016, International Data Corporation conferred the Smart City Asia/Pacific Award in the economic development category on the NTP, and in 2017 it won the World Summit Information Society (WSIS) Prize in the e-business category. The latter recognizes outstanding digital projects worldwide, which foster socio-economic development. 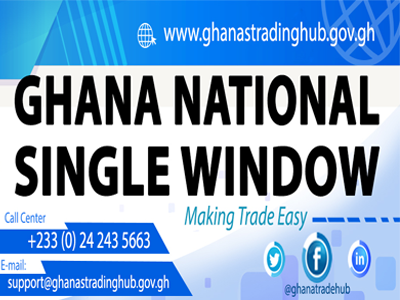 During the intervening decades, the concept of the Single Window has also evolved – from the Customs automation era, to trade information exchanges, limited Single Windows connecting traders with a single regulator (e.g. Customs, port, etc. ), to nation-wide NSWs that allow all parties to submit standardized information only once to fulfil all regulatory requirements. Trade is to a large extent today cross-border. Digital connectivity for the NTP must, therefore, go beyond our little red dot and interoperate with other trade communities and platforms, regardless of geography or technology. Singapore is not the only country embarking on a trade digitalization journey. All around the world, there have been hives of activity around trade digitalization fuelled by a combination of pressing business needs and pain points, combined with new possibilities and disruptions from emerging technologies. There is now a growing willingness among businesses across the globe to digitalize, and like-minded governments and Customs authorities to ensure open and fair trade around the world. With this, Singapore is now taking another bold leap into the digital trade world. In November 2017, one month before the NTP became operational, the Monetary Authority of Singapore (MAS) signed a Memorandum of Understanding with its Hong Kong counterpart to jointly develop a cross-border distributed ledger technology (DLT) based utility infrastructure that will link up digital trade platforms and the growing number of trade-related DLT platforms and communities around the world. The seeds of what was to become the Global Trade Connectivity Network (GTCN) were sown, and the GTCN is expected to be operational in 2019. The GTCN is envisioned as an industry-neutral, service-agnostic, cross-border utility infrastructure that does not aim to control or dominate partner networks. For a start, it will provide a common view for trade finance applications between Singapore and Hong Kong, empowering participating banks to share immutable and auditable ledger across the border, while maintaining data privacy and confidentiality through a distributed network. This allows the various stakeholders to retain control of their own commercial and financial destinies. However, the GTCN will be larger than Singapore-Hong Kong and will go beyond trade finance, even though the initial minimum viable product (MVP) is funded by monetary authorities. The GTCN marks the first attempt to integrate digital platforms starting with Singapore and Hong Kong, and aims to address and provide digital solutions to challenges prevalent in international trade, where differing trade regulations and documentation standards predominate. In addition, the GTCN would help lay the foundation for a regional digitalized trade and supply chain platform in Asia. The end outcome is to enhance supply chain transparency, integrity and security. The power of the whole is always greater than the sum of its parts. Just as the benefits to the economy are far greater than the sum of individual firms’ bottom-line and top-line gains. The NTP and the GTCN play complementary roles to stitch up the global trade ecosystem, empowered by both DLT and non-DLT based technologies. The GTCN will technically enable different stakeholders to connect through DLT platforms and automatically exchange information between parties, according to specific protocols, as shown in Figure 2. In the world of cross-border trade, where different regulators such as Customs authorities, central banks and monetary authorities, food and health regulators, and security agencies, interact with a myriad of business (logistics, ocean and air freight, warehousing and trucking, banks, and traders of every imaginable form), one can easily imagine the potential of the technology. DLT is useful where there is no central authority and the community self-orchestrates and self-organizes. Information is only written into the distributed ledger, timestamped and digitally signed, after consensus has been reached between the parties involved. Any change thereafter is a new entry to the ledger. This feature of DLT provides for protected data storage and provides a sense of transparency, enforcing accountability where there is no central authority. Kurt and Gervais list three conditions where DLT will make sense. First, where there are multiple mistrusting entities, and there is no agreement on who is an online trusted third party. Second, there are multiple writers of data and there is data to be stored. Finally, the multiple mistrusting entities must want to interact and change the state of a system. Linking up digital trade ecosystems, like any collaboration, can only succeed when the diverse needs, interests and concerns of all stakeholders are satisfactorily addressed. Because needs and interests are often different and evolve differently for stakeholders over time, all parties find it challenging to entrust the control of any shared platform to any single party. DLT emerges as the technology with features that are a good fit for the GTCN. The ‘connect once, connect to all’ model of the GTCN allows all participants to quickly scale their own connectivity to a wide spectrum of national Single Windows operated by governments and digital platforms in the B2B space, which cater to a wide spectrum of business and transaction needs. Here, the need to manage interests not only traverses countries, but also various industries and companies, with each of these interests intersecting and interacting with their own countries’ regulators and authorities. Taken together, the distributed authority and immutable characteristics of DLT has made it possible for the GTCN to address not just the functional needs of integrating digital trade across the trade ecosystem, across borders, but also the underlying challenges of marrying various stakeholders’ interests and associated trade-offs that would have to be agreed upon before the possibilities of a shared platform without a single, central authority. 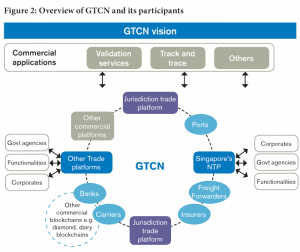 The GTCN’s vision to connect different trade platforms without intervening in each platform’s rules and processes is ambitious, but probably not new. While the GTCN’s success is not dependent on DLT per se, the characteristics of DLT have removed some long standing stumbling blocks when a large number of parties, often unknown to each other, come together to interact and transact. One critical success factor remains – willing actors. As Adam Green writing for the Financial Times notes, while the technology might be tamper-proof and collaboration-friendly, “the same is not always true of its users.” Despite uncertainties with DLT, such as scalability, many acknowledge that, in cross-border trade, at least, participants would benefit from DLT. Despite the vast potential of DLT to address the stumbling blocks of cross-border digital trade connectivity, there is still a critical role for regulators to play, by, for example, providing data governance and standardization to ensure interoperability. Perhaps it is more important than ever before for regulators to do so. With the technology capabilities in place with the advent of DLT, it is perhaps timely that regulators get together, step up and lead efforts to harness and harvest the potential that this new technology offers, as well as lead efforts to digitally connect trade end-to-end, across industries and across borders. United Nations Economic Commission for Europe (UNECE) Trade Facilitation Implementation Guide, Single Window Evolution. [Accessed online on 19 Aug 2018, http://tfig.unece.org/contents/single-window-evolution.htm]. Wust, Karl, Gervais, Arthur, Do you need a Blockchain? International Association of Cryptologic Research (IACR) ePrint Archive, 2017. Trade Point Portals were envisioned as gateways to global electronic networks with National Trade Points interconnected in a worldwide electronic network. Source: United Nations Economic Commission for Europe, Trade Facilitation Guide, ‘Single Window Evolution’. [accessed online on 19 Aug 2018, www. Cc. Green, Adam, Will blockchain accelerate trade flows? Financial Times, 11 Nov 2017. [Accessed online at https://www.ft.com/content/a36399fa-a927-11e7-ab66-21cc87a2edde ].